Oh how I've missed you! 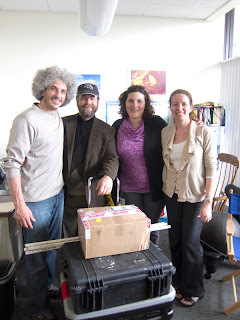 As you've periodically seen since the 2009 expedition, we've been busy analyzing data, preparing manuscripts, setting research agendas, trying to finance our plans, and have been busily preparing for the 2012 expedition. Yes, you read that correctly: the 2012 expedition will be setting sail on June 4 from Samoa. We're all excitedly preparing! In the past, we've posted a bit about the research gear necessary for the trip, and have shown you what 100+ checked bags looks like. But we haven't revealed the secrets behind our ability to blog from PIPA, or any of the other myriad preparations that are necessary. Until now. Far from the wilds of the central Pacific, we test our equipment in the urban wilderness (aka the NEAq docks). 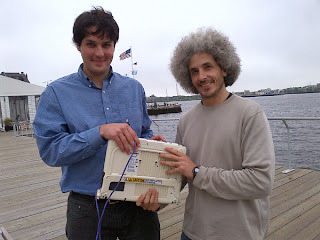 Here, you can see Jeff Ives (NEAq) and Keith Ellenbogen (bluereef) testing our satellite capabilities. Keith will carry this all the way to PIPA, which will enable viewing of his PIPA photography while at sea. So! Happy Memorial Day weekend, and we'll be posting more soon. Very soon.